The Red Lion was at one time an important inn in Newmarket - it no longer exists and there are no buildings left that give any clues about its construction. 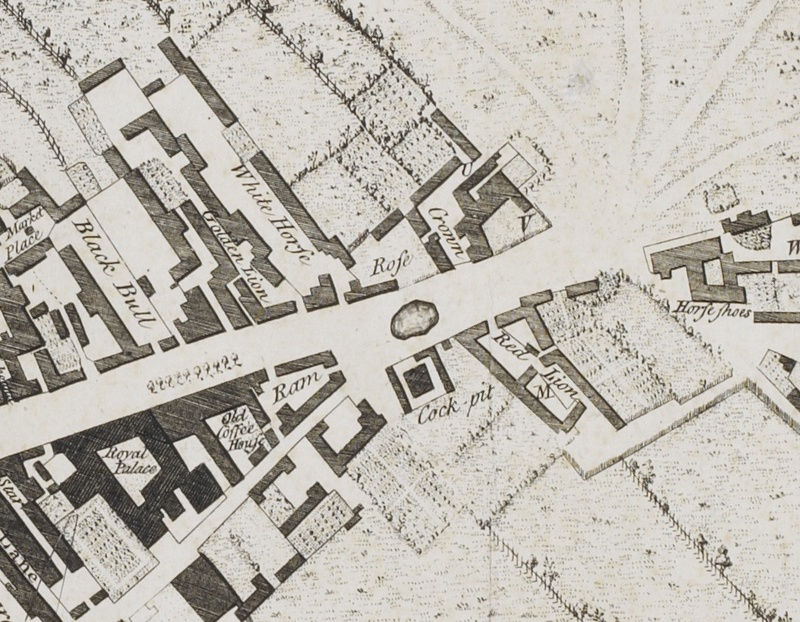 It's also shown on both of Chapman's maps of Newmarket of 1768 and 1787. If you refer to the interactive map page and hover the cursor over the High Street end of Rous Road you'll see that the location of the Red Lion straddles Rous Road, with a row of buildings on each side of the road - the courtyard in between approximately following the line of the present day road. MARRIED. On Wednesday last Mr. Baldwin, of London, to Miss M. Edwards, daughter of Mr. Edwards, of the Red Lion Inn, Newmarket. Desirably situated for Business, in the High-street, near the Public Hall. At the White Hart Hotel, Newmarket, on Monday, May 28th, 1855, at Seven for Eight o'clock in the Evening precisely, by direction of the Proprietor. ALL those TWO newly-erected brick-and-slated DWELLING HOUSES and SHOPS, situate and being at the East End of the Town of Newmarket, in the Parish of All Saints, in the County of Cambridge, abutting North on the Public-street, South on part of the Estate of the Marchioness of Hertford, East on houses now or late belonging to Mrs. Levett, and West on premises formerly used as an Inn, called the " Red Lion," as the said Dwelling Houses, Shops, and Premises, with the appurtenances theruneto belonging, are now in the several occupations of Mr. Samuel Howlett and Mr. Wm. Turner, Boot and Shoe Makers, at a Rental of £40 per annum. Part of the Purchase-money may remain on mortgage. The above very desirable Houses and Shops have been substantially erected, and fitted up by the present proprietor at considerable cost within the last three years. The Fixtures, which are all modern and of the most useful character, will be included in the purchase. There is a pump of excellent water, which is used in common with the tenants of the adjoining property. Further particulars may be known on application to Mr. William Cripps Kitchener, Solicitor; or to the Auctioneer, Imperial Fire and Life Offices, High-street, Newmarket. at No.103 High Street. and No.105 High Street.